Small volumes of anti-CAV1 antibody vial(s) may occasionally become entrapped in the seal of the product vial during shipment and storage. If necessary, briefly centrifuge the vial on a tabletop centrifuge to dislodge any liquid in the container`s cap. Certain products may require to ship with dry ice and additional dry ice fee may apply. the caveolin family (caveolin-1, -2, and -3) have been identified with different tissue distributions. Caveolins form hetero- and homooligomers that interact with cholesterol and other lipids (1). Caveolins are involved in diverse biological functions, including vesicular trafficking, cholesterol homeostasis, cell adhesion, and apoptosis, and are also implicated in neurodegenerative disease (2). Caveolins interact with multiple signaling molecules, such as Galpha subunit, tyrosine kinase receptors, PKCs, Src family tyrosine kinases, and eNOS (1,2). It is believed that caveolins serve as scaffolding proteins for the integration of signal transduction. Phosphorylation at Tyr14 is essential for caveolin association with SH2 or PTB domain-containing adaptor proteins, such as GRB7 (3-5). Phosphorylation at Ser80 regulates caveolin binding to the ER membrane and entry into the secretory pathway (6). 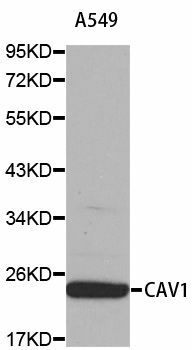 Western blot analysis of extracts of A-549 cells, using CAV1 antibody. NCBI/Uniprot data below describe general gene information for CAV1. It may not necessarily be applicable to this product. Caveolin-1: May act as a scaffolding protein within caveolar membranes. Interacts directly with G-protein alpha subunits and can functionally regulate their activity. Involved in the costimulatory signal essential for T-cell receptor (TCR)- mediated T-cell activation. Its binding to DPP4 induces T-cell proliferation and NF-kappa-B activation in a T-cell receptor/CD3- dependent manner. Recruits CTNNB1 to caveolar membranes and may regulate CTNNB1-mediated signaling through the Wnt pathway. Homooligomer. Interacts with GLIPR2, NOSTRIN, SNAP25 and syntaxin. Interacts with rotavirus A NSP4. Interacts (via the N- terminus) with DPP4; the interaction is direct. Interacts with CTNNB1, CDH1 and JUP. Interacts with BMX and BTK. Expressed in muscle and lung, less so in liver, brain and kidney. Belongs to the caveolin family. 2 isoforms of the human protein are produced by alternative initiation. 1. hSlo1c associates with Cav-1 in human brain microvascular endothelial cells. This association boosted Cav-1 transfer from the cell membrane to the cytoplasm. It is crucial for regulating the permeability of the blood-tumor barrier.